The market is located on the west side of the Lechaion Road immediately to the north of the Lechaion Road Basilica. The building is only half excavated. In its original form the structure was a rectangular court with an interior colonnade measuring ca. 15.74 x 24.32 m with rooms along the sides and back. The identification of the building as a macellum (market) is based on the discovery of fragments of an inscription mentioning the donor Quintus Cornelius Secundus, found reused in a later context and dating to the Augustan period. Following the earthquake of the 70's A.D. a semicircular Ionic colonnade was built within the rectangular peristyle and the building probably continued to be used as a market. Broneer, Oscar. "Area North of the Basilica," American Journal of Archaeology 30, 1926, 49-57. West, A.B. Corinth VIII, ii, Latin Inscriptions 1896-1926. Cambridge, MA, 1931, no. 125. Williams, C.K. II. "Roman Corinth as a Commerical Center," JRA Supplement 8, The Corinthia in the Roman Period, T.E. Gregory, ed., 1993, 40-41. 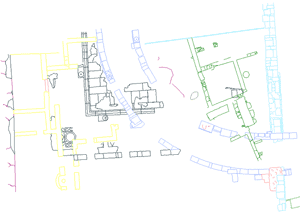 Figure 1: Restored plan of the market north of the Lechaion Road basilica in Corinth, A.D. 150. Figure 2: Actual state of the Roman market, early Grek trader complex, and Late Roman hemicycle.